Homepage. 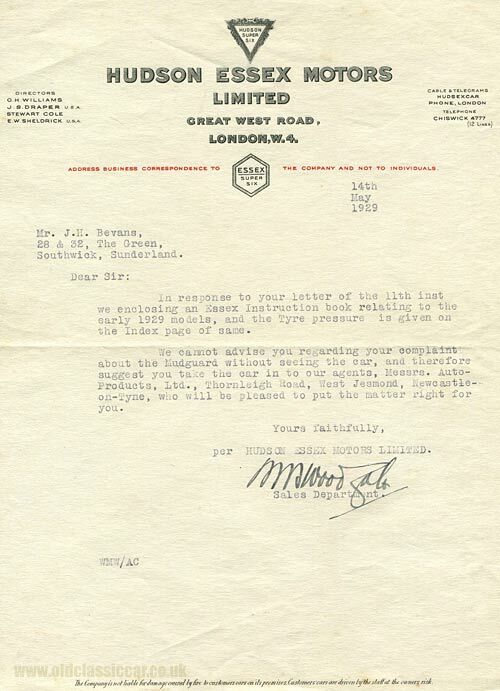 This page: Receipt issued by this motor car company in the early 1930s, and a letter from 1929. Hudson Essex cars of London. 1. A receipt dating to 1933. 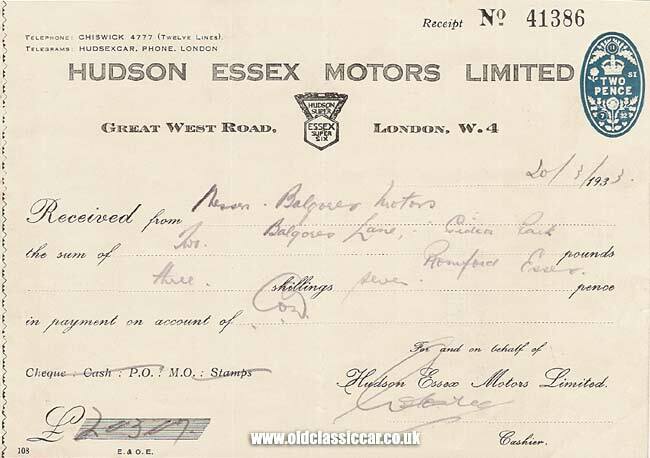 The first of the two Hudson Essex Motors items for this page, a receipt from the early 1930's, turned up amongst a collection of old motoring paperwork. It was issued in March 1933. The receipt was for all of £2:3:7, or two pounds, 3 shillings, and 7 pence, and was made out to Balgores Motors, of Gidea Park in Essex. 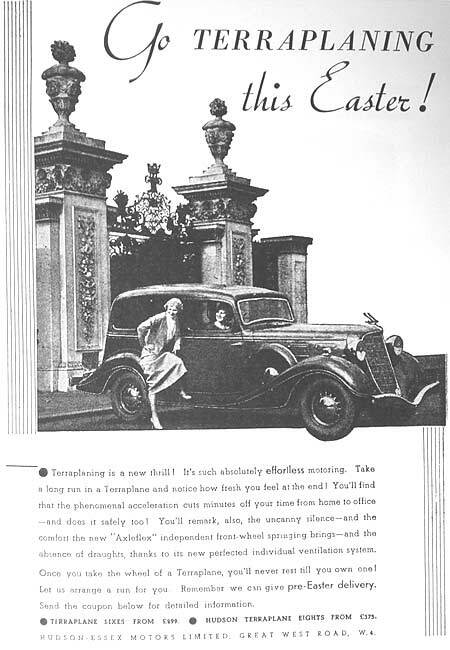 The Hudson Essex company produced some stylish motorcars in the 1930s, and two of their better known models get a mention in the stylish billhead seen here - namely the Hudson Super, and the Essex Super Six. 2. A letter from Hudson Essex Motors posted in 1929. The next item turned up in 2010, and dates to 1929, ie a little earlier than the receipt shown above. Like that item though, it mentions the Hudson Super Six, and also their address on the Great West Road in London W4. It would seem that a Mr Bevans, of Southwick, had contacted the firm, requesting a copy of a handbook for his brand new 1929 Essex. All apparently wasn't as it should be though, as the letter also refers to a complaint that the owner had made about one of the car's mudguards. The factory's recommendation was that Mr Bevans take the car to his local sales agency, Messrs Auto-Products Ltd, of Thornleigh Rd, West Jesmond, Newcastle-On-Tyne, who would be able to attend to the problem. More information on the Hudson, Essex (and Terraplane) marques can be found on this Hudson club site, and if you want to view some current adverts for Hudsons etc, have a look at the Hudson page in the oldclassiccar classifieds. A vintage Essex can also be found on this page in the vintage photo gallery.